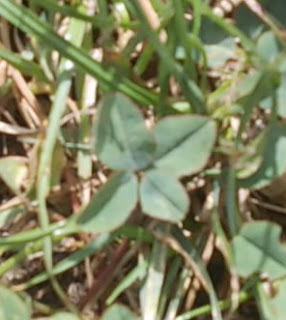 I'm not much of a believer in four-leaf clovers, or les trèfles à quatre feuilles, as they're called here. I believe you make your own luck or that God has a plan for what "luck" you will have. 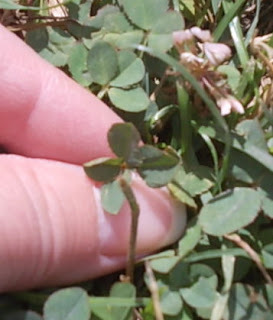 But it hasn't stopped me from looking for these clovers all my life. And I find that French people are just as intrigued by them as Americans. When we moved to France in 2004, I always arrived early at the bus stop for Alex. While we'd wait, we often hunted four-leaf clovers. At first, I think the kids and adults there found it odd to see us staring into the grass, chatting away in a language they didn't understand. But once we started showing them the results of our research, they started to join us. More and more and more. It became a bit of a fad. And oh, the excitement when they found one! Where you do find one, you'll often find others. So if you do get lucky, don't quit looking. I once found 17 in the same spot as a child on Martha's Vineyard. I've found many in my own backyard here in La Ferté and just outside our yard along the public walkways. I've lost track of my exact count to date, but it's more than 300. The two here and one other came from a spot near the Cosson River earlier this month. So, J., watch your mail! I'm shipping you a bit o' luck o' the Irish..... from France!